UPDATED: Wed., May 31, 2017, 5:03 p.m.
KABUL, Afghanistan – A suicide attacker struck the fortified heart of the Afghan capital with a massive truck bomb Wednesday, killing 90 people, wounding 400 and raising new fears about the government’s ability to protect its citizens nearly 16 years into a war with insurgents. Most of the casualties were civilians, including women and children, said Ismail Kawasi, spokesman of the public health ministry. But the dead also included Afghan security guards at the facilities, including the U.S. Embassy, while 11 American contractors were wounded – none with life-threatening injuries, a U.S. State Department official said. 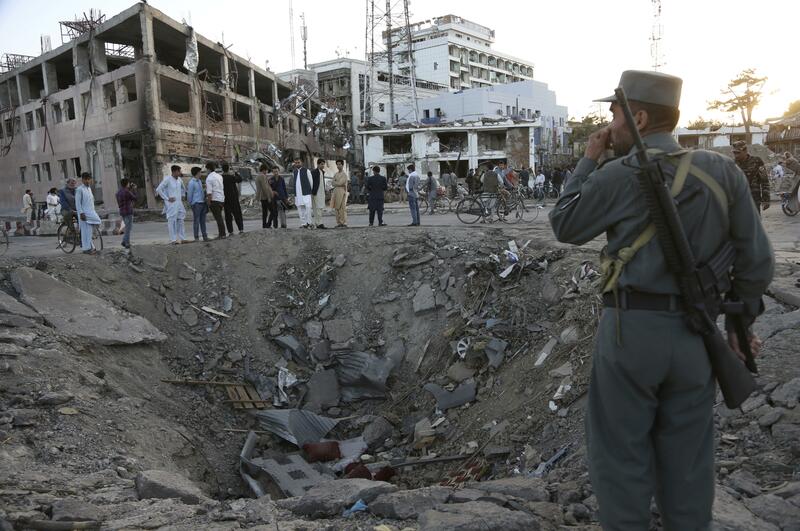 The blast gouged a crater about 5 meters deep near Zanbaq Square in the Wazir Akbar Khan district, where foreign embassies are protected by a battery of their own security personnel as well as Afghan police and National Security Forces. The nearby German Embassy was heavily damaged. “The terrorists, even in the holy month of Ramadan, the month of goodness, blessing and prayer, are not stopping the killing of our innocent people,” said President Ashraf Ghani. “The United States stands with the government and the people of Afghanistan and will continue to support their efforts to achieve peace, security, and prosperity for their country,” Tillerson said in a statement. Although they are small in number, militants from the Islamic State in Khorasan – an ancient name for parts of Afghanistan, Iran and Central Asia – have taken credit for several brazen assaults on the capital. It “targets all of us – whether in Manchester or Berlin, Paris, Istanbul, St. Petersburg or today in Kabul,” she said in the southern German city of Nuremberg. Published: May 31, 2017, 7:50 a.m. Updated: May 31, 2017, 5:03 p.m.